A few weeks back I posted about the gel manicure I had at Nails Inc over at Debenhams in Meadowhall (post here). I explained in that post that I didn't actually have a full gel manicure as I was going to be removing it myself and also needed to be able to at least remove the colour quickly if I needed to for work. Unfortunately I did remove the colour after just a week in case I did get a role that nail varnish would have been completely inappropriate for (I didn't get it in the end!) and I was surprised to find that I love the look of just the clear gel base on my nails. 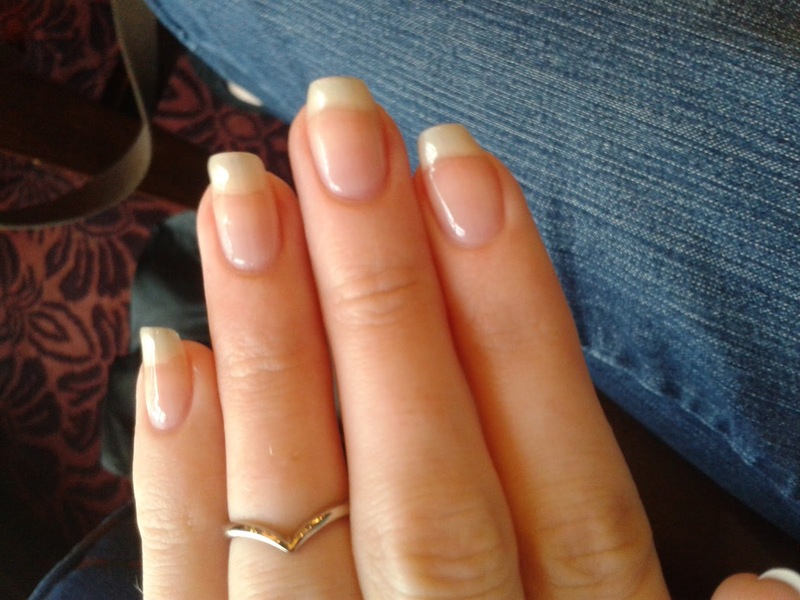 A picture of my nails taken in the pub while I waiting for my boyfriend to order our lunch. I had ribs, chips and coleslaw and it was lovely! I've never particularly been a fan of having just a clear nail varnish on my nails, in fact I don't like the way it looks, but a clear gel varnish is just so glossy it looks amazing. I'm actually considering buying a gel top coat specifically for creating this look, although I would obviously use it over the top of coloured varnishes as well. Any recommendations? I have my eye on the new Models Own one. On another note, when I did come to remove the clear gel I soaked cotton pads in nail varnish remover, popped them on my nails, wrapped silver foil round to keep them in place and sat back to wait for it to work. It only took about 30 seconds before I started to feel the burning sensation on the skin around my nails. I quickly pulled off the foils and got my fingers into some water. So I think I can safely say I won't be having a gel manicure again as I don't know how I'd remove it. I ended up having to pretty much peel and scrape the rest of the gel off, which didn't leave my nails in the best condition, and even a few weeks later I think some of it is still on my nails. Oh and while I'm talking about my nails, if you have problems growing your nails try taking a Calcium and Vitamin D supplement. I've started taking them because I'm concerned about my bones and they've done my nails the world of good, they're currently about double the length they are in the picture above. Are you a fan of clear varnish on nails? I've wanted to get gel nails to try them and I'm scared of removing them myself so the first time I might pay to get them removed. Your nails do look pretty without the polish though and just the gel.